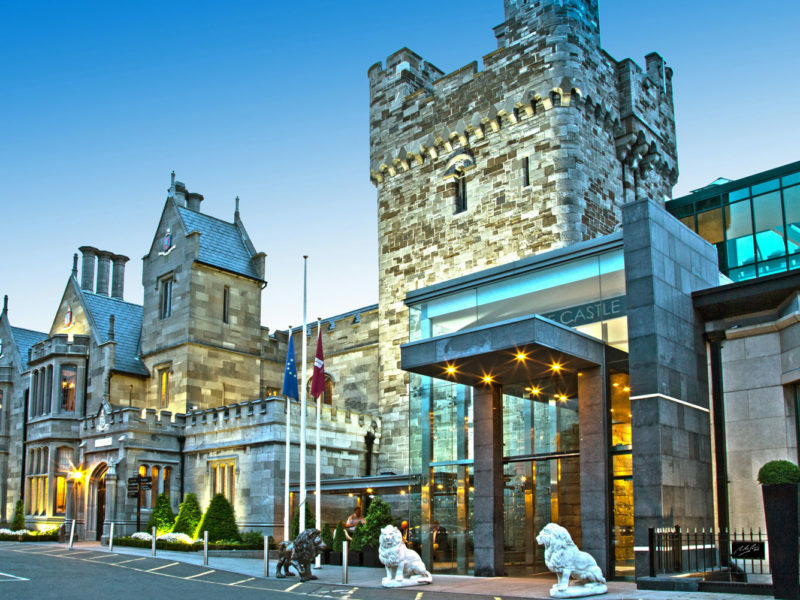 Clontarf Castle Hotel combines an 800-year-old facade with contemporary design. With visions of grandeur playing in her head, Jennifer Pinkerton has a castle-lite experience in a new take on an old classic. “Clontarf Castle, forthwith!” I instruct the Dublin cabby. Bluster aside I’m feeling a wee bit sheepish about my night at the castle. Is it a tad touristy? Indeed it is, as confirmed by the sea of American accents and peak caps filling the hotel foyer. I scan the stone lions, mounted deer heads and suits of armour around me. Regal-looking furniture collects under glass ceilings. Saxophone jazz drifts overhead. A backlit panel behind reception displays neat lines of antique keys. Relaxing outdoor area at Clontarf Castle Hotel. It’s clear the architect’s brief for the hotel’s seven-year-old renovation was to let the light in and mix old structures with new. And it works, without looking forced. Boxy glass walls complement rather than overshadow the original castle – which I note is quite small, by castle standards that is. “Am I staying in the posh castle bit of the hotel?” I ask, channeling my best Kath and Kim. No, I’ll reside in the ‘new’ section of the building. In fact we all will, the Americans and I.
I haul my luggage to the first floor and feel my breath rise in excitement upon seeing the sign ‘Viking Suite’ on the door in front of me. Alas, I’m in the wrong corridor. But my own ‘Executive Room’ is not without charm. The space, about five metres-squared, holds a four-poster bed and has an extra add-on section, much like a smoking room. The lemon-and maroon-coloured furniture all looks new, as does the bathroom. It even boasts one of those flat, wide showerheads I so adore. Before my brainpower fades with the daylight, I gather my satchel and trip downstairs to poke around. Inside a guest suite at Clontarf Castle Hotel in Dublin, Ireland. At the entrance to Knight’s Bar hangs a framed issue of The Irish Penny Journal dated September 1840. It’s 73-year-old local Brian Healey. He’s standing just shy of the pub doors, lighting up a smoke. 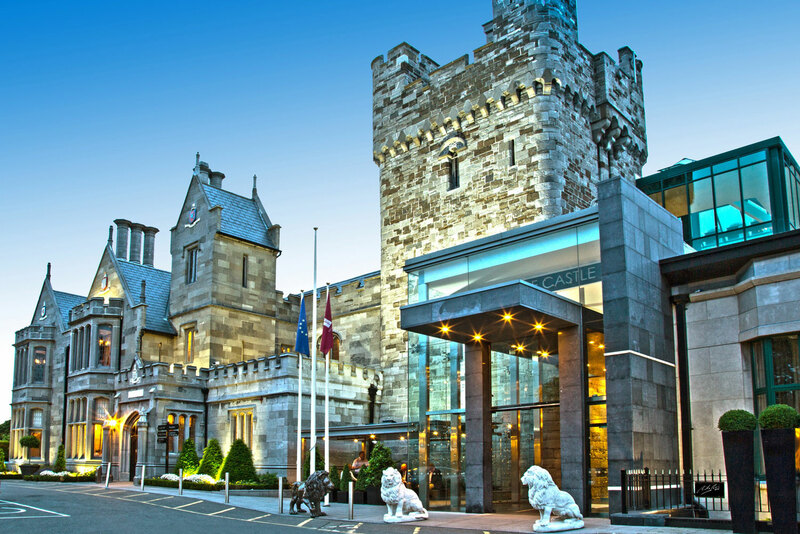 From the unprompted history lesson I learn Clontarf Castle was first built in 1172 as part of Dublin’s inner defense line, but the building has had several incarnations since then: a family home, a cabaret venue and, since 1998, a four-star hotel. Fahrenehit Annex restaurant at Clontarf Castle Hotel, Dublin. For reasons I don’t quite understand, Brian insists on giving me a parting gift – a lighter etched with the slogan ‘Cusack’s. A unique maritime pub’. The Knight’s Bar, I discover, doesn’t quite match its billing as a place “evoking a feeling of medieval romance”. That said, it is sweet. With an ornate ceiling, fireplace, stained glass windows, studded leather chairs and, my favourite touch, a carved gothic backdrop behind the bar, it’s close in feel to an old hunting club. What’s more medieval are the spaces linking the bar with the hotel foyer: orange-lit holes-in-the-wall; cosy spots for a pint. The next morning I find myself in the hotel’s pretty café, the Fahrenheit Grill. It feels like a church attic. Lacquered black beams line its walls and frontage, a tangle of history and luxury. Amid whispering honeymooners, I happily polish off my buffet breakfast. It’s here that my castle experience begins to find form. This is indulgence, but the approachable kind – ‘castle chill’ if you will. Kath and Kim, I’m afraid, just wouldn’t fit in. From Dublin Airport, take the M1 towards the city centre, turn left at the first set of traffic lights onto Collins Avenue. Continue to the end of the road to a T-junction where it intersects with the Howth Road and bear left. The second set of traffic lights take a sharp right onto Castle Avenue, and you’ll find the entrance to Clontarf Castle Hotel at the first roundabout on the right hand side. “The castle’s history and eateries are loaded with colour but I was looking forward to sleeping in a castle, not just dining in one. Jennifer paid $230 for an Executive Suite.